While this explanation does speak to what science does not yet know about depression, it isn’t very helpful. That’s true especially for people who are struggling and seeking answers, or for family members and friends that are trying to help a struggling loved one get better. It’s especially difficult to understand depression and how a person gets it, if you’re someone who has never experienced it. To make it simple to understand – even with all the unknowns around depression – Depression Zone has produced a depression recovery map and guide that walks you through how depression occurs, the factors within each of the three variable that lead to breakdown when not managed, and how to treat each one. This article contains a detailed explanation of the roadmap with instructions on how to use it. The minute you realize you have depression your state of health is already in a serious crisis mode. One or more of the actions you’ve taken or external factors in your life related to your body (state of physical health), your environment (environmental stressors) or the way you think and handle life (learned emotion-coping skills), is ineffective and has led to a malfunction in your mood. People only get depression when one or more of the following variables (see image below) that contribute to overall wellbeing breakdown. It may help to think about the human body as a car with many different components that allow the car to function when they all work together. But when one or more components of the car malfunction the entire car stops working effectively slowing it down — or all together, forcing it to stop. If your body is not functioning at normal levels you may be experiencing a brain chemical issue that’s causing you an inability to be happy due a physical deficiency. There are many ways this can happen: Improper nutrition, another underlying medical condition, abuse of substances, a genetic pre-disposition (not fully understood yet, but there is significant supporting evidence). The physical assessment checklist included with this infographic will help you understand if there are physical issues at play. All people suffering from depression should see a medical doctor for a thorough physical assessment. The world around you – your environment – and what you deal with on a regular basis due to your lifestyle choices and as a result of things that happen spontaneously to you (i.e. like a loved one’s death) can affect your mental state. Prolonged stress that isn’t managed can cause a major breakdown in your mood and extract some of the joy that you experience life. The environmental assessment checklist included with this infographic asks questions that allow you to review all areas of life to see if any lifestyle changes can be made to improve your mood. In some cases, the depression you’re experiencing hasn’t reached the physical level and is simply a result of extreme stress due to environmental challenges. In cases like these some people simply need to make some serious lifestyle changes to improve their mood significantly. At Depression Zone we refer to this type of depression as “situational depression”. All people suffering from depression should thoroughly assess their life to see if there are changes they can make to get closer to what they want for themselves in areas of career, relationships, self-love, finances, and purpose. If you’re not particularly trained on how to handle emotions and manage stress (most people are not well-trained to manage stress, because this isn’t something that is taught. It is often picked up from parents when kids are young), you may need to learn some new skills for dealing with life challenges. The way you choose to react when you’re dealing with a tough situation in life – aka your behavior – can cause more negative results. The learned emotion-coping skills assessment checklist will help you identify areas to work on and improvements you can make to your behavior. All people suffering from depression to look at what behaviors they engage in that don’t serve them or that have major negative impacts on their life or other people. 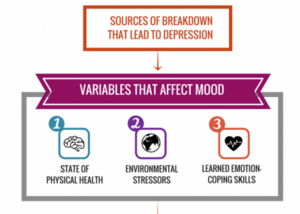 The infographic has three accompanying checklists that help you delve deeper into each of the variables that can lead to depression. If you ask yourself the questions on the checklist you’ll be able to understand whether that variable needs work or is not a major issue. After you go through the questions on each checklist, you’ll gain a deeper understanding of what’s causing your depression. The variables that are affected will dictate actions you need to take to seek effective treatment. For example, if you have a physical issue you may realize that you need to make some diet changes to try and improve mood. If that doesn’t help, you may need to consider an antidepressant medication (if suggested by a doctor). If you realize that there are issues in your life – like you’re struggling with finances regularly – you may need to make some lifestyle changes. These types of changes often require guidance and support from experts and/or learning new skills. Most people find that they fall into the third variable, that they lack effective emotion-coping skills. Many people won’t even really understand what that means until they learn better ways of stress management and more productive behaviors. Emotional IQ skills are not formally taught. Most people learn as they go, which is not the most effective way of navigating life. If you need help in this area find a life coach or therapist that can work with you. Behaviors take time to retrain. Depending on your core issues, the map will point you towards the actions you need to take to effectively treat and correct your concerns. Keep in mind that making significant changes to any of the three variables of malfunction can take a great deal of time. The recovery process can last from weeks to years. But putting in the work to correct issues of wellbeing is worth it. When you take the time to isolate the potential sources of depression, it will help you to take effective treatment actions and to eradicate the depression altogether (for some people) in the future. Think of it this way: An obese person can go on a diet and lose weight, yes, but the diet only treats the weight issue not the food issue. So that person will still have an issue with food and is at a higher risk of becoming obese again. Do the work now to get to the possible sources. Deal with the issues through therapy, medications or lifestyle changes, and later in life you’ll be mentally healthier than most people. What that really means is FREEDOM. Life is great when you feel great and don’t have mental or physical issues dragging you down and know how to manage life challenges in positive ways when they arise.